Mrs.Temiwumi Laura Tope- Banjoko attended Our Lady of Apostles Private School Yaba, Lagos. She proceeded to Holy Child College Obalende, Lagos (1975-1980) for her secondary school education and Methodist Girls High School, Yaba for her A’ Level (1980-1982). She thereafter attended University of Lagos, Akoka where she graduated with Bachelor of Science (Hons) degree in Psychology (1985) and Master of Science degree in Industrial Relations and Personnel Management (1987). She also holds a Bachelor of Laws degree from University of Ibadan (1990) and was called to the Nigerian Bar in 1991. From April 1992- November 2011, she worked in various departments in Equatorial Trust Bank and became Regional Head South West. 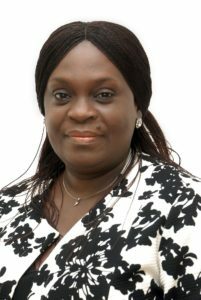 From November 2011 – January 2018, she worked with Sterling Bank Plc. in the Senior Management Cadre until her retirement. She was the Business Executive, Retail and Consumer Banking for South West 1 region. Temiwumi is a seasoned and technically skilled business professional with proven records of accomplishment. She has sound managerial, communications and interpersonal skills. She also has solid leadership skills with ability to build and guide top-performing teams. She enjoys cooking, music and traveling. She is blessed with four children. Entwicklungslinien der https://ghostwriter-hilfe.com/diplomarbeit/ grundschulpdagogik, bd beitrge zum mathematikunterricht, teil ii.